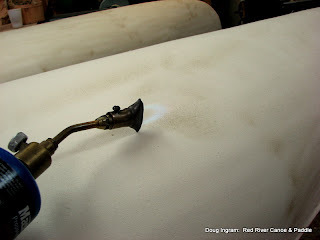 After the canvas is finished being closed in at the stems, the nap is burned off. The novice is fearful of this step, fearing fire, but canvas is surprisingly fire resistant. You have to hold the flame quite awhile in one spot before the fabric starts to burn. Little threads are more likely to smolder along the weave than the whole thing is to catch fire. Done! Here they are with their filler applied. 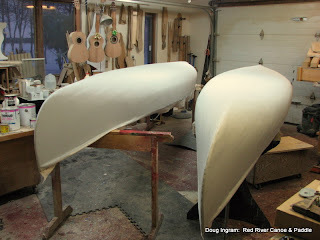 They will be sitting aside in the shop until they are set enough to receive other work. That will be Monday. Meanwhile I've been cleaning and organizing; tedious, but necessary. Posted by Doug Ingram at 10:07 p.m.